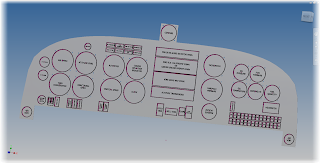 CAD Programs as Tools. 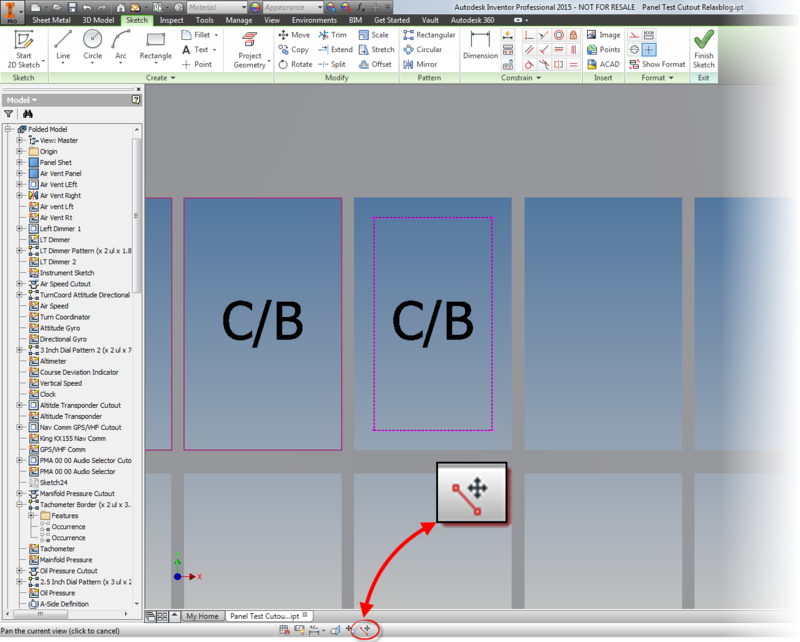 CAD Drafting as a Trade. This post was inspired by random internet searching, and stumbling onto an interview with Mike Rowe of Dirty jobs, that really made me spend quite a bit of time contemplating things. It even caused me to search around more for more articles. Here is the video. It's about 40 minutes long, but I found it fascinating. So what is the point of this? Does this even apply to those using CAD? Is Jon just rambling on? Mike Rowe said one thing that struck me. "I do believe, whatever your job is, if you approach it like a trade, you'll be better for it." Now, like Mike Rowe, this isn't me attempting to bash higher education. I have a Bachelor of Science in Mechanical Engineering, and I wouldn't trade that for the world. I'm proud of that. But on the other hand, my father made a living with a wrench in his hand. 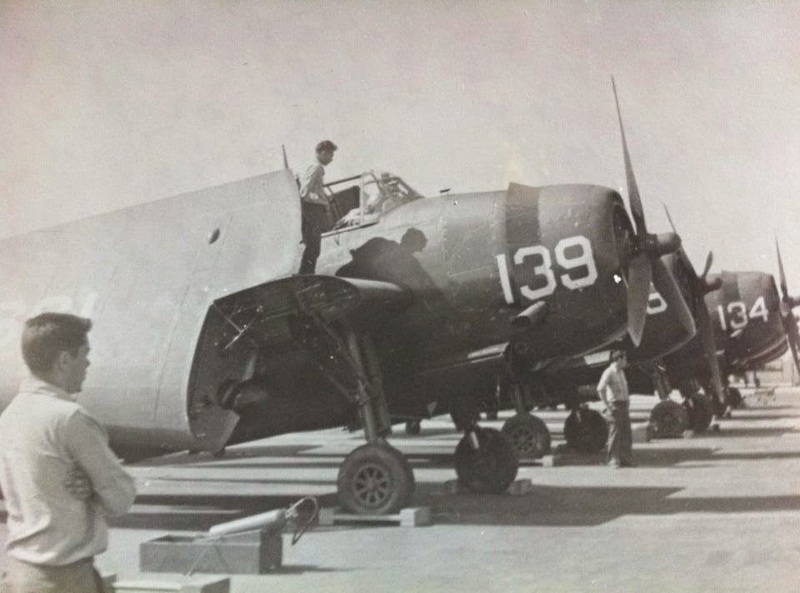 He crewed and worked on aircraft in the U.S. Navy. 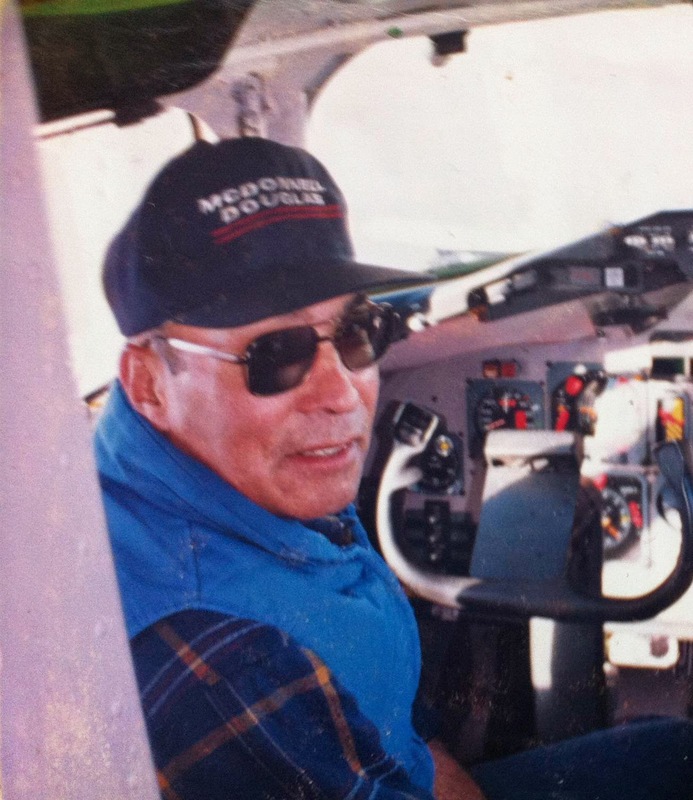 After that he was a certified Airframe and Powerplant mechanic for Western Airlines, and finally McDonnell Douglas. He was a tradesman, and a very good one at that. The Avenger. My father worked on these in the 1950s. My father in the early 1990s. And I've been fortunate enough to have him as a mentor, and many like him. I've been lucky enough to be mentored by woodworkers, machinists, and aircraft mechanics. I've learned to respect the skilled workers who create with their hands. Of course every one of these skilled workers has their tools. The implements that are more than just what their mass and volume represent. They're an extension of a workers hands, a way of making a living. Thinking about that a moment, isn't CAD a tool? 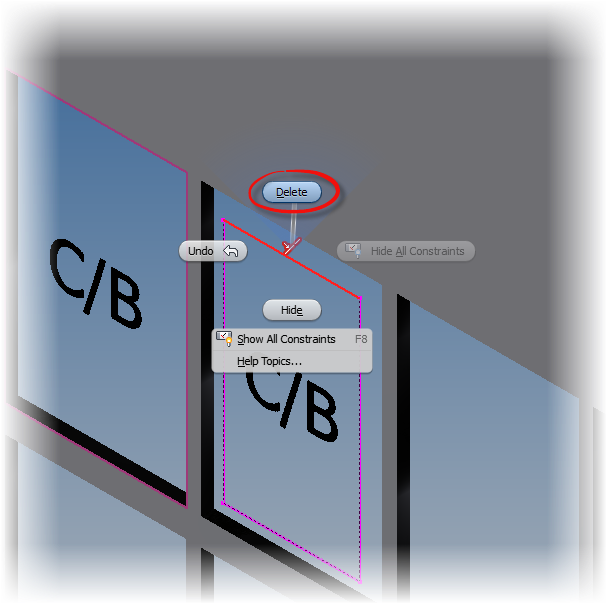 As designers using CAD, isn't that the extension of our hands? 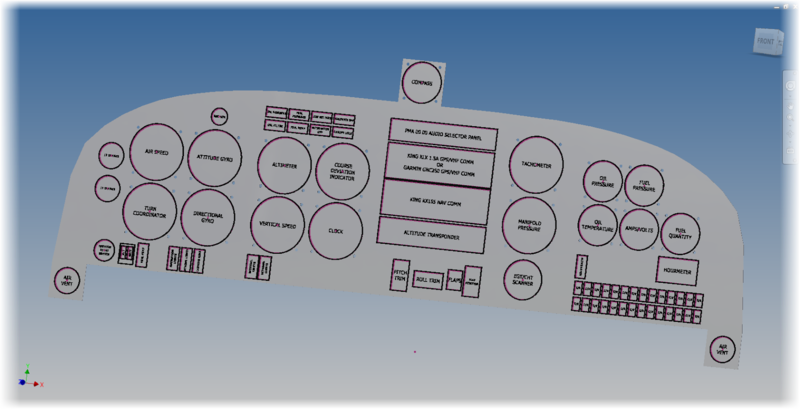 When it comes right down to it, is a CAD program, be it, AutoCAD, Autodesk Inventor, Dassault Solidworks, Revit, CATIA, ProEngineer, and so on. Aren't they our tools? 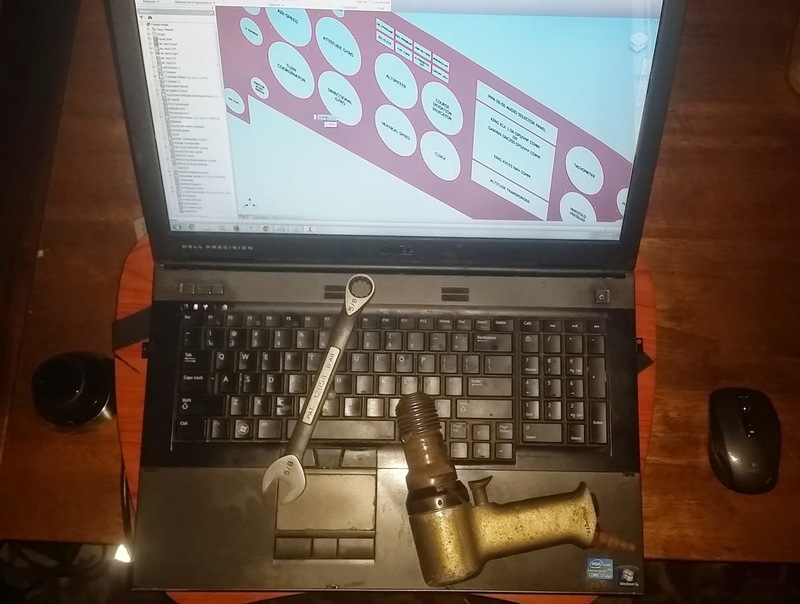 Autodesk Inventor, laptop, and 3DConnexion 3D mouse. Are they different than the wrench and rivet gun? Or different tools for a different trade? And since these are the tools of our trade, shouldn't we be trying to use them to the best we can, to hone our craft and get the most we can out of them? Does that mean you need to go and call your reseller and buy thousands of dollars of custom training? Maybe. That would make your account manager very happy, but sometimes we're not able to do that. Does that mean you seal yourself in your basement, and spend hours upon hours honing your skills on the product of your choosing? Perhaps. But that's not something everyone is able to do. There are commitments and family, and time is valuable. What it means to me, at least, is to find what makes me better. 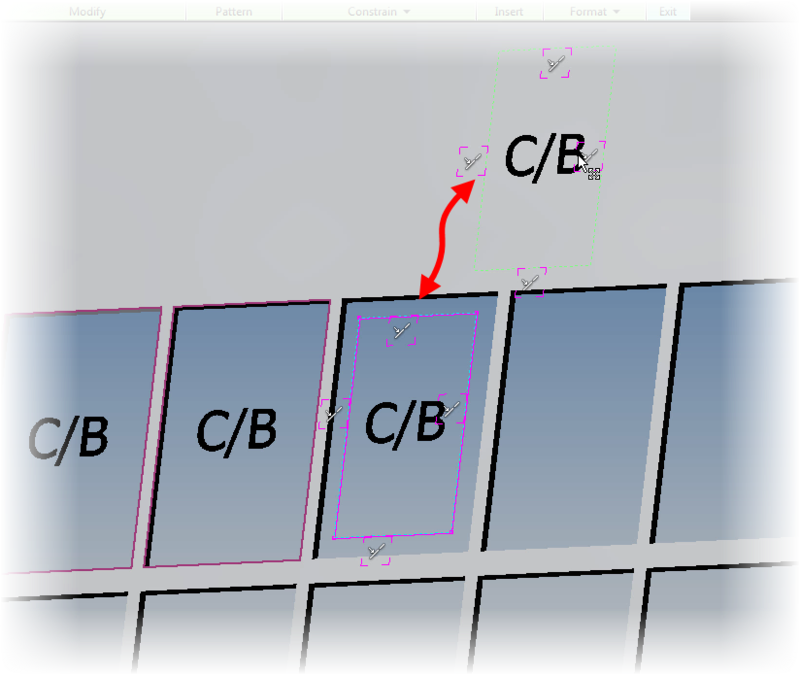 From a CAD perspective, that means I spend time looking at articles from some great sources. I would also love to attend Autodesk University every year. But alas, that one isn't in the cards for me, at least not this time. Why? I learn things I don't know, it teaches me to look at problems from different angles. It encourages me to try new things I may not have thought of. I've also started taking Aircraft Maintenance Classes at Mount San Antonio College. Someday, I could learn enough to earn my own Airframe and Powerplant license, although it's going to take me a long time. A sheet metal practice plate I used to practice riveting in class. It takes practice to learn this skill! I also volunteer at Planes of Fame in Chino, Ca. 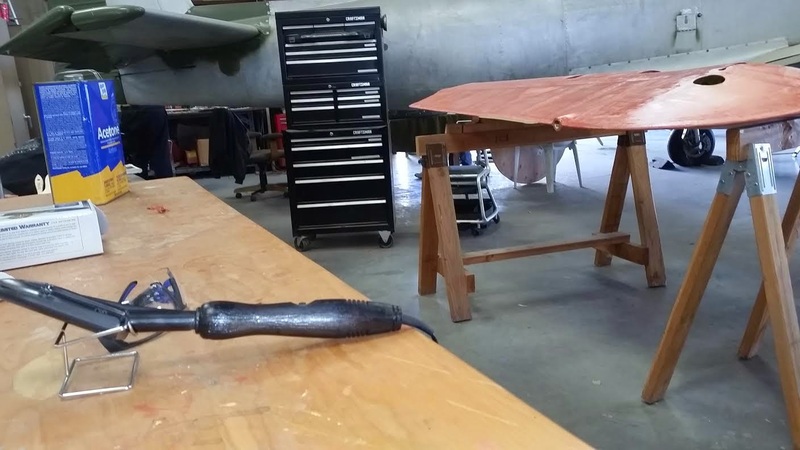 I'm lucky enough to help recover fabric control surfaces there, and see aircraft mechanics who have become so skilled with their trade, they've crossed into a realm that has become pure artistry. heat shrink the fabric used in the process. These are the tools of the fabric trade. Why? It keeps my hands dirty. I get to understand why something is done and how things go together. I learn the things that can't always be learned by reading manuals and watching videos, or even sitting in a classroom. Does that mean that this is your formula? Should you go read blogs galore, take classes. Is this how you "think like a freelancer" as Mike Rowe put it? No, it doesn't. It represents the choices I've made on how to improve how I use my tools. It's how I sharpen my own freelance. If anything, you should find your own resources, your own way of learning how to increase your knowledge, and improve your skills. Ultimately, it's a choice we're all faced with making. And every choice, including choosing not to decide, is making a choice. Oh, and is using CAD, any CAD, a trade? In my opinion? There's no doubt the answer is yes. 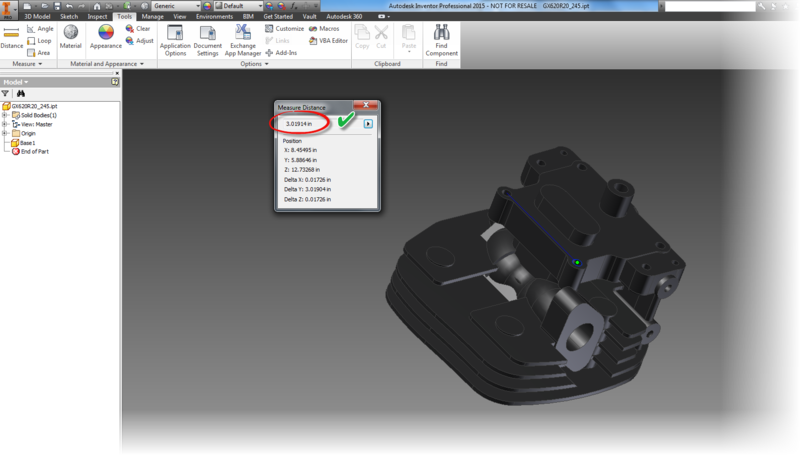 Sometimes, it takes the right circumstances to find a good way to use a new feature in Autodesk Inventor. 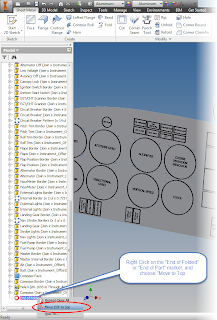 The new Relax mode in Inventor 2015 fell squarely into this bucket. When it first came out, I was frankly a little unsure of the new tool. It's my nature. I just find myself wary of any tool that is "too automatic". I'm just type "A" enough to not like it when too much is done for me. I circle them like a cat sizing up a potential meal. But I've also learned that there is a time and a place for these tools too. Experience has taught me to never dismiss a new function too quickly. In my case, I was rebuilding an aircraft instrument panel in Inventor. Originally, I had created it as a test to benchmark how text affected the speed and file size in Inventor. To do this, this, I created the cutouts for the instruments as extruded borders with text inside. but this was part of a test and not meant to be "real" at this point. Not accurate as a part. But perfect for the benchmark I was creating! But once I had done that, I wanted to create a more accurate representation of the panel. This meant deleting the extruded borders, and recreating them as cutouts. But as I did that, I ran into one issue. Part of the sketch that I had removed had anchored the text that I had placed. Now the geometry was disassociated. I could delete and recreate the sketch, but I didn't want to try to retype all that info again. But what I did find was able to delete constraints to free the geometry and reattach it to other geometry, In some cases, this meant deleting four co-linear constraints, and recreating them all over again. This is what I would have to do with these circuit breaker cutouts, for example. While it wasn't a huge pain for a few of them, there were a ton, there was a lot to do, so how could I make this task go a little quicker? 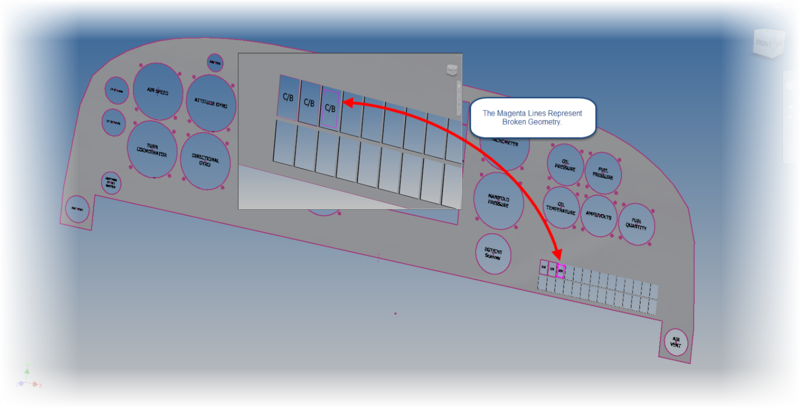 Well, if you guessed that I used the "Relax" constraints mode that's new to Inventor 2015, you would be guessing correctly! 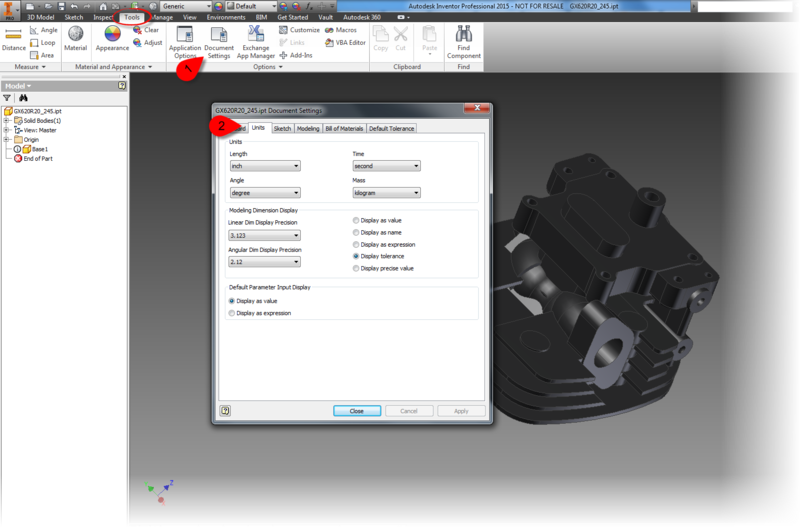 First, while editing the sketch in question, I turned on Relax Mode, It can be found at the status bar on the bottom of the Inventor drawing screen. 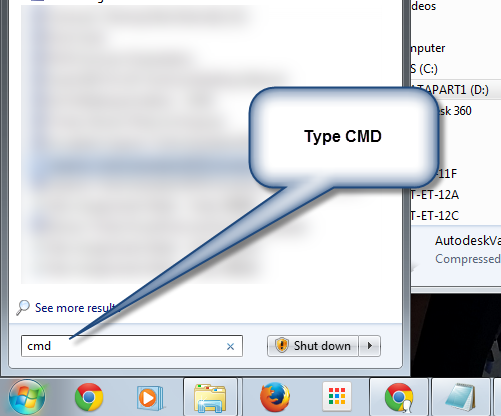 You can also use the hotkey "F11"
Once that was on, all I had to do was grab the text and drag it. The constraints would automatically be removed, and I apply the new sketch constraints right away. Is it a small thing? Perhaps. 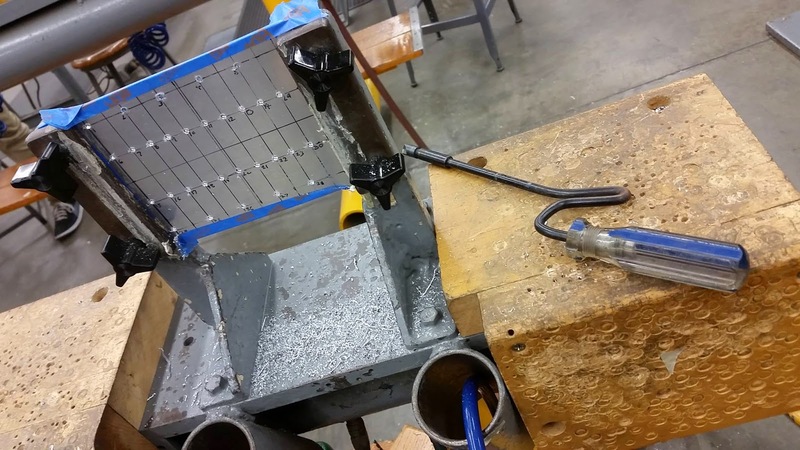 But over time, it did make fixing the panel a lot easier! A simple thing? Perhaps. But it can be the simple things that matter. Today I wrapped up some basic benchmarks for extruded text versus sketched text in an Autodesk Inventor part model, and I was getting ready to e-mail them out for some testing on external systems. First, what did I use for the test? 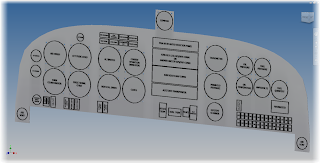 The files I created were from an instrument panel for light sport aircraft from the RV series. I recreated the panel from an image, and created the instrument identification first as extruded text. In the next panel, I created a panel with the same text, but this time, the panel the text was created as sketches, and not extruded into 3D extrusions. The panel with sketched text. You can tell by the projected sketch lines, which are magenta. The challenge? 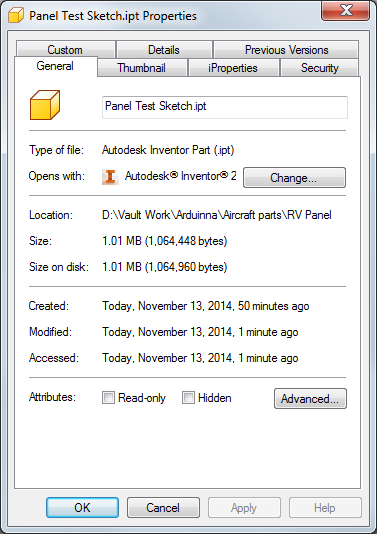 The panel with the extruded text was nearly 13 MB! By comparison, the panel using just sketches was less than 2 MB! 1.64 MB. Nearly a tenth the size! First, let's take a moment to ponder that. If you're creating a lot of text, consider leaving it as sketches. These two models show a big difference in the size, and that can affect performance, especially if there's a lot of them. But there was also another challenge I was facing. How can I e-mail the files? Together, these files are flirting with 15 MB. That's big enough to cause problems with some e-mail systems. Sure, I could zip the files, but there's another way to "compress" an Inventor file. Locate the End of Part marker. It's also known as End of Folded if you're using a sheet metal part. 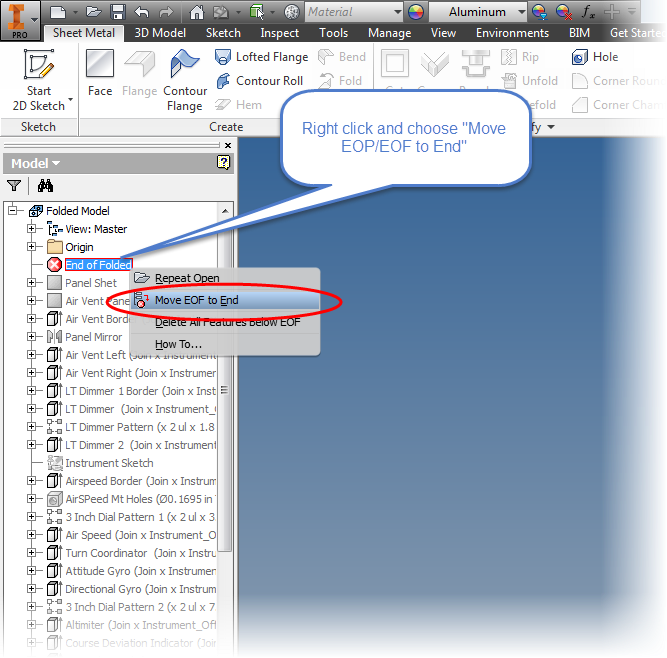 Right click on the marker and choose Move EOP to Top (or Move EOF to Top for sheet metal parts). Locate the End of Part marker. This pushes the marker to the top, and all the a feature in the part are suppressed. After compression, the part with extruded text was a mere 2.41 MB. 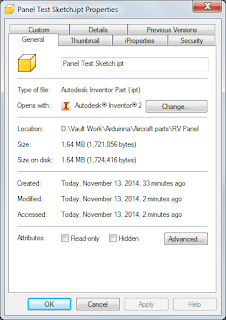 By comparison the panel using Sketches was 1.01 MB. Not as drastic as the larger file, but substantial nonetheless. A smaller change, but still about a third. Having that trick can make it much easier when moving large part files back and forth. When the recipient gets the file on the other end, just right click on the EOP/EOF marker and choose Move EOP/EOF to End. This can be a nice way to "compress" an Inventor file without having to use zip files. So when you're sending part files around, take a look! It's worth a glance. Oh!, And if you have an unsuspecting coworker, rolling the EOP to the top of their part when they leave their computer unattended has been known to be an "April Fools Trick" in the past. Thanks to Clint Brown of Cadline Community for sharing a nice bit of iLogic code that will rollup the EOP marker and put it in an email for you. It's definitely work taking a look at! Have a look by clicking here! 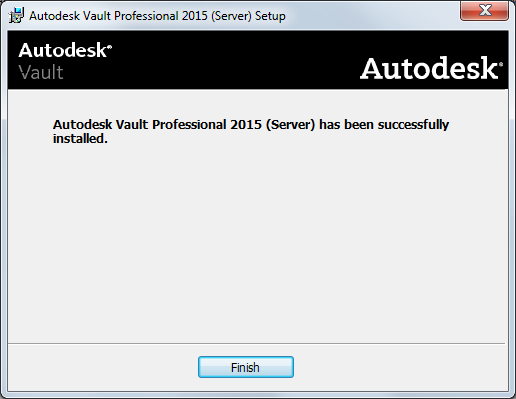 Autodesk Vault 2015 Service Pack 1 is Out! 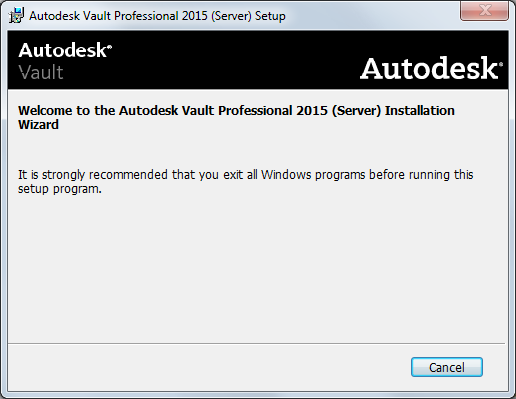 It's that time again, a new Service Pack for Autodesk Vault. It can be downloaded by clicking here! So what are the steps to install it? Without going any further, it's all spelled out in the readme files that are included with the service pack. And no matter what you do with this blog post, you should be reading those! This is particularly true if you're working in a replicated environment. The steps in this post are the steps for a single site update! These are the files you should reference! With that being said, let's begin. 1) First make sure you have a backup. In reality, you should be checking this already, but this is a good time to make recheck and make sure. There's always the chance of something unforeseen going wrong! I've never had a service pack fail to install, but I've talked to people who've had power outages occur right in the middle of an install. How is that for bad luck? 2) The system will be down for a while. 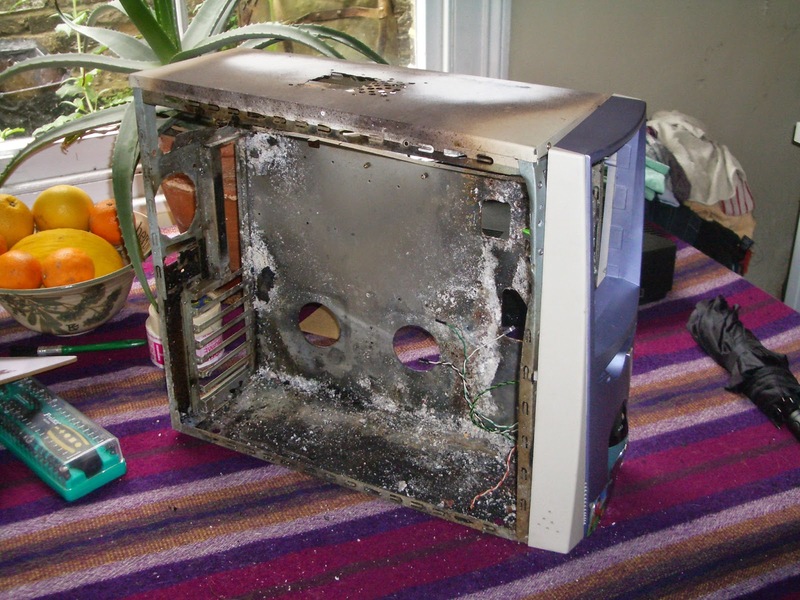 Don't plan on running this upgrade on the server in the afternoon just before a project is due. The service pack migrates the database, during which time the Vault will be closed for business. Don't be the guy calling tech support and end up being told "Yeah, dude. You're just gonna have to wait for that to finish.". These are common steps in planning, but they're often overlooked, and I think they're important to mention. Now, we get to start the service pack process! 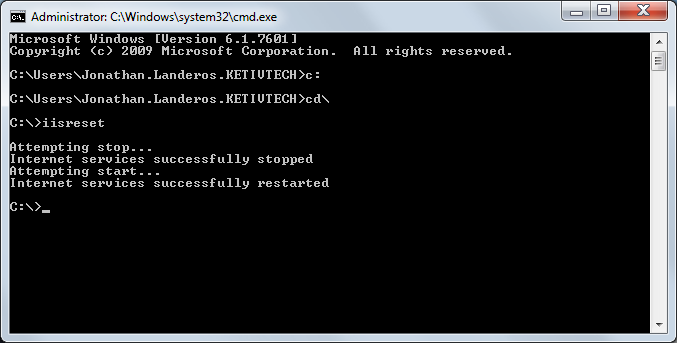 Once the command prompt opens. Type IISRESET. This bounces the IIS service. Now, you can finally click on the *.msp file to start the Vault Server service pack. Now the service pack will install. Give it time to finish. After a bit, the service pack will tell you it's done! All done! Or is it? 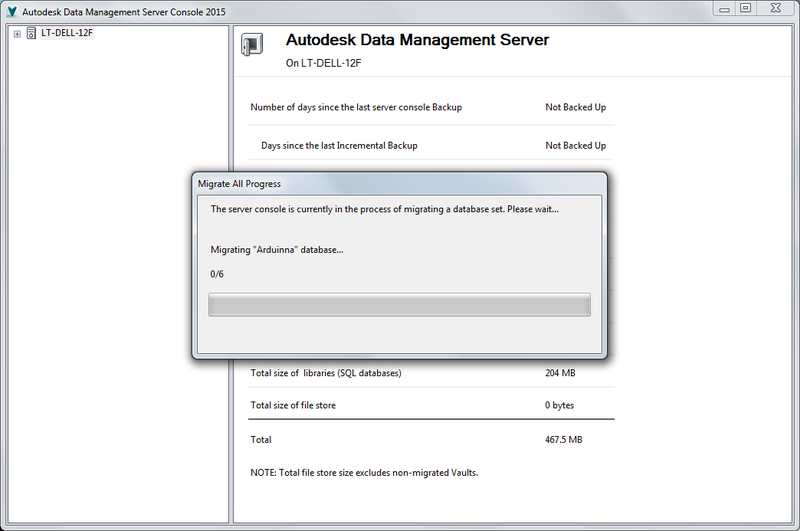 Once the service pack is installed, open the ADMS Console, and make sure the databases are migrated. Vault will ask you several questions during this series of steps. First, it begins a before you log in. Next, Vault will ask you to log in, and which Vaults to migrate. I've never done anything but pick all. You might think you're done, but if you have custom content libraries stored in Vault, you're going to see a few more questions. 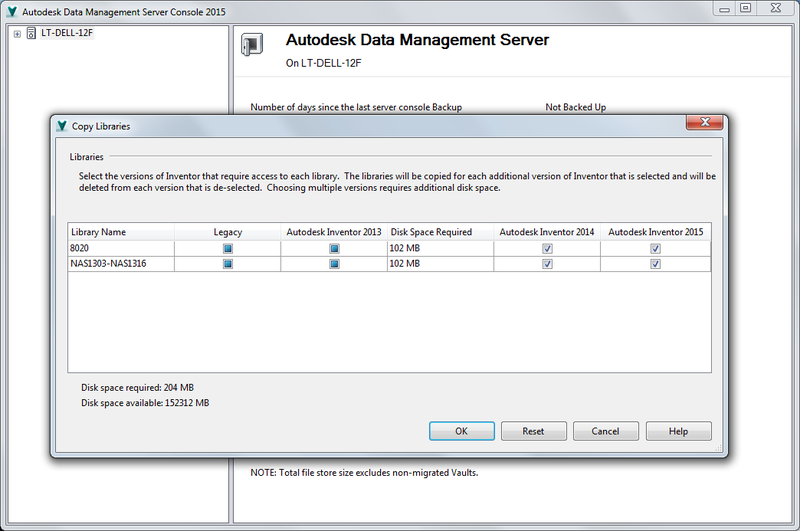 Vault is asking you if you want to keep copies of libraries for multiple versions of Inventor. 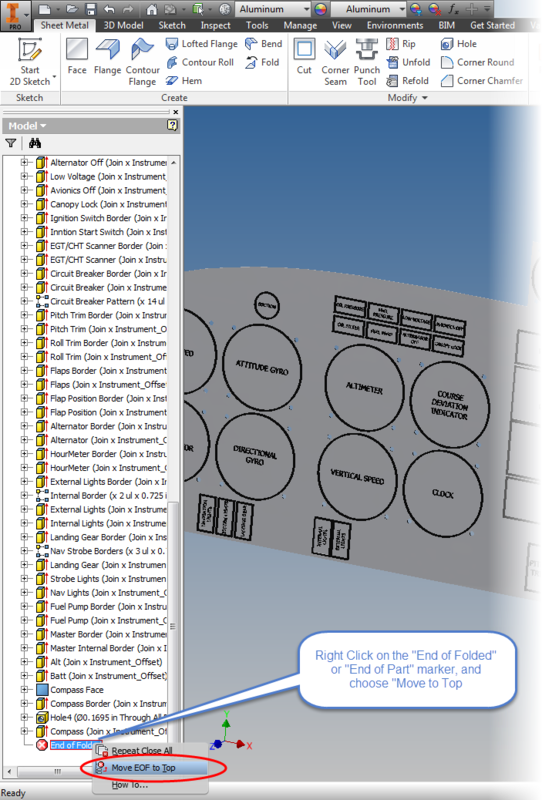 If you're not using old versions of Inventor, this is your chance to get rid of old libraries. Clicking OK on this dialog box brings up yet one MORE dialog box. What I call, the "are you sure?" dialog. It's a final confirmation to make sure that the clicks you've made are correct. Are you sure that you're settings are right? Now, at long last, the screen we're hoping for. Success! So those are the basic steps. Vault updates aren't that difficult with a little planning. The next step is to move onto the clients installs. Those are pretty easy, and while you should update the clients as soon as possible. Those can be done at a much more leisurely pace. KETIV's AMA 2014 in Southern California is a wrap! It was good to see everyone, and as much stress as it was preparing for the session I helped in, it was fun presenting again. But out of that course came one question that I didn't know the answer to. 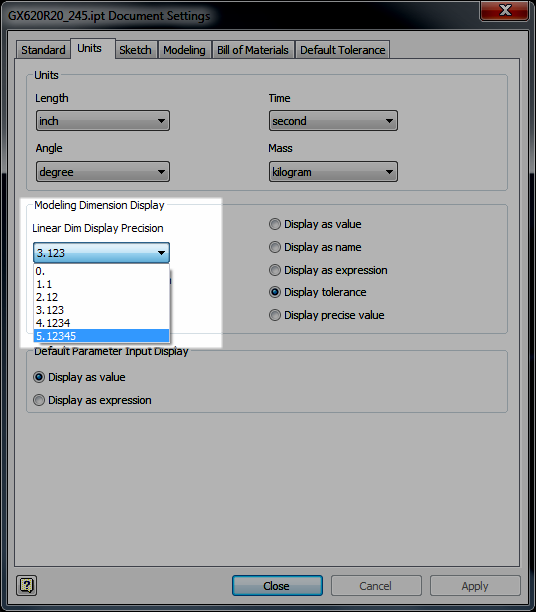 "How can you change the default measuring precision in Autodesk Inventor?" At the time, standing in front of the room, I didn't know the answer. After all, I don't know everything! But over the weekend, the thought would occasionally return to me. I felt like there might be a way. Finally, I had a little bit of inspiration, and decided to give it a try. Opening up Inventor, I played a little bit of a hunch. 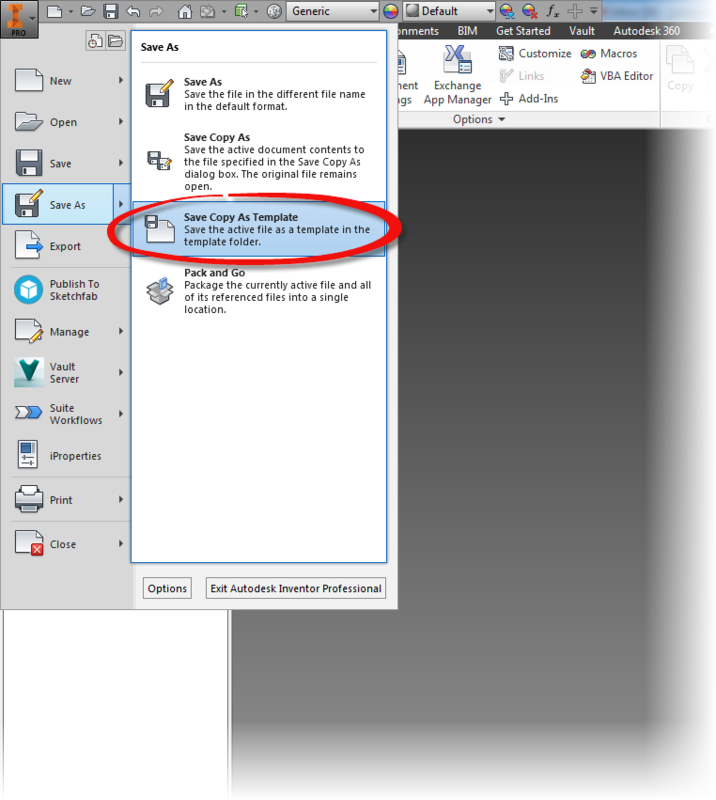 On the Tools tab, I located Document Settings and opened up the Document Settings dialog. Once on the Document Settings dialog,choose the number of decimal places you want by changing the Linear Dim Display Precision (or angular if that's your preference). Once that's done, the measure precision will change for this document. But wait, I said default setting, right? If you want to make this a default behavior, the final step would be save these settings into a template file. One way would be to open the templates from their location, make the very same change, and save that file. This would change the existing templates. 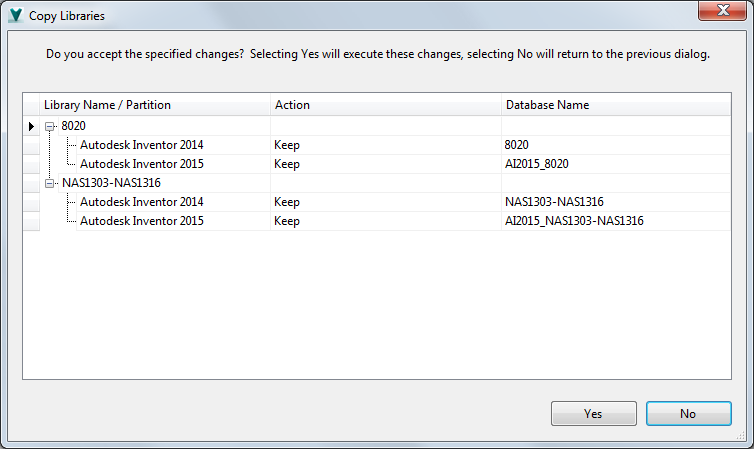 The other would be to start a new file, make any changes you want, and choose the Save Copy As Template option. Whichever you choose is up to you! On a final note. I know that there are those who might want a different functionality. And that's okay! 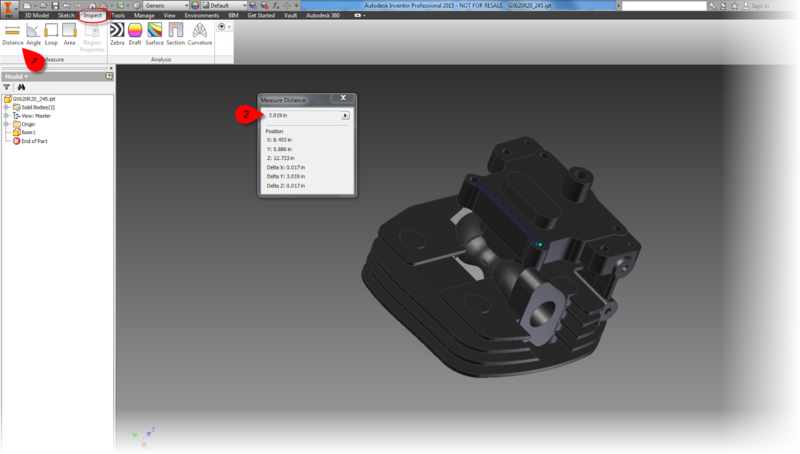 Share your ideas on the Autodesk Inventor Ideastation!